I was fishing for steelhead on one of my favorite drifts on the Sandy River. It was a nice morning and the river was in perfect shape, so I methodically began to work the fly down with purpose. As I continued to cast, I idly glanced across to the other side of the river and enjoyed a panoramic view of a small herd of deer feeding on the edge of the woods. Suddenly, I was jolted out of my euphoric state when a good sized fish aggressively took the fly. As it began to jump I could easily see that it was hooked on the dropper. It was a strong fish and made several long runs down river, but after seven or eight minutes it began to submit to the rod’s constant pressure. It was a wild fish, and as I brought it closer I began to look for a good place to land it. There were large rocks and some underwater snags to contend with, so I wanted to release it quickly. 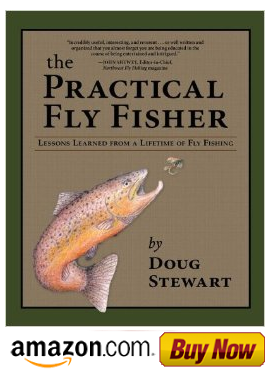 I slid the fish close to the shoreline and with my left hand I started to pull the fly from its jaw. This was almost a fatal mistake because the fish suddenly got a new burst of energy and bolted away from my grasp. Luckily, I grabbed the tippet just above the point fly and stopped the fish. As I released it, I realized that I could have been playing the fish with my hand! This was a foolish error that could have ended up in disaster. To put it another way, "A jerk on one end waiting for a jerk on the other.” The most sensible thing to do was to not release the fish until it was completely played out. Also, keep the fish in the water and use needle nose pliers or hemostats to unhook the fish.